I currently have two jobs. 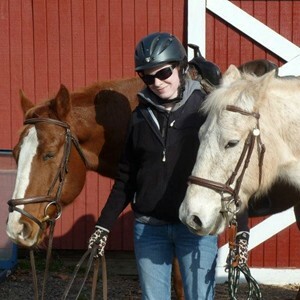 I own my own business called Mandy's Horse Training in Vienna, VA. I offer training and riding instruction. Due to my dual certifications in Training and Teaching, I am able to switch between the two whenever necessary for my client's needs. My other job is working for graduate Kelly Lagos at her facility - Full Circle Farm. 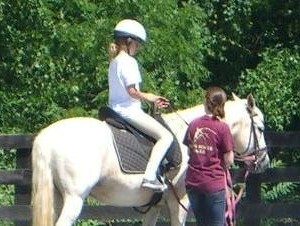 I care for the horses and farm as well as ride the lesson horses for tune-ups and extra exercise. I love being part of the full spectrum of horsemanship, from the day to day interactions as well as riding, teaching and training. What is your favorite memory or takeaway from MM? My favorite takeaway from Meredith Manor was actually one of my least favorite memories in the moment! I was riding one particular horse for a number of weeks, with long term goals. However, this horse had a well-earned reputation for being a challenge, and on top of that we simply did not get along. He tested me more and more until one week he threw all his tricks at me at once, leaving me uncertain and overwhelmed. In that moment I had two options: accept my instructor's offer of a temporary horse swap with another student in my class, or work through the issues despite my emotional concerns. I chose the latter of the two options, and that marked a turning point in my riding. It took a couple rides but I became more confident in my riding, and the horse and I came to understand each other. We ended up competing in Showmasters together and won a 1st and a 2nd place in our equitation and reining classes! While I wanted nothing to do with him during the difficult week, these days I'd give anything to get to ride him again because he was probably the best 4-legged teacher I've ever met. The comfort zone is a nice place to be, but it doesn't get you anywhere. My experiences at Meredith Manor gave me the tools necessary to face a wide variety of situations and challenges I have faced and will continue to face in the horse industry. I worked with so many different horses, especially in my training classes, I learned how to handle all kinds of situations. So far in my career I haven't encountered a situation that I could not work through and improve. Even if I had not previously worked through the specific issue, the skills learned allow me to respond in an appropriate manner. This gives me great confidence in my upcoming years of being in the horse industry. In my final quarter I was the Training 1 trainer, the person who worked with a completely untrained horse in front of Dr. Ron Meredith (the founder of the school) and the entire group of 1st Quarter students. My job was to clearly demonstrate how to work with a horse. Those extra hours and the responsibility of so many eyes on me, was fantastic practice for being in the industry. The experience of demonstrating our training methods directly transfers over to when I teach my clients how to better interact with their own horses. I could not imagine being half the horsewoman I am without my time at Meredith Manor. Any advice for students attending Meredith Manor? Appreciate everything, especially the horses that test or frustrate you. The challenging horses are the ones who teach you the most, and you'll remember a few of them for a long time. I've worked with a couple horses in my career that made me think "I'm thankful for learning how to ride through and improve that situation, due to riding ____ at school." And if you happen to be on a horse you feel is "too easy," look for the ways you can improve the horse. There's no such thing as a wasted ride, except one during which you don't even try. Trust your instructors. They've been doing this for many years (and even the newer instructors, they have the guidance of the more senior staff members) and they know the horses quite well. There were times I was pushed outside my comfort zone, and thought my instructors were crazy, but I later realized they were just pushing me past a plateau of my skills. I'm a better horsewoman because of my instructors pushing me. You get out what you put in. No one is above cleaning stalls or feeding horses, and if you aren't open to learning new ways of riding and training you won't learn anything. Meredith Manor can teach you more than you could realize, about horses, about people (and life) in the horse industry, and about yourself. All you need do is have an open mind and be willing to learn!